Fat Cat Valve Oil is ultra-refined petroleum oil that chemical tests have shown to have fewer impurities than other popular valve oils. 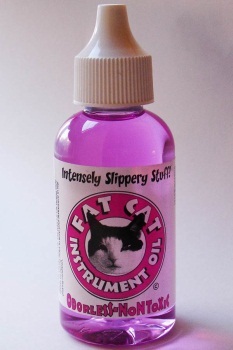 Fat Cat's viscosity ("thinness or thickness") is similar to other "fast" oils but works better because of its purity. OSHA considers Fat Cat Oil as non-toxic, non-carcinogenic, non flammable and non hazardous. Be assured that Fat Cat Oil will work extremely well in trumpets, baritones, euphoniums, French horns and tubas of all makes and ages. Its precision applicator tip makes it especially easy to reach rotary valve bearings.